Plan now for a memorable grand finale in this year’s garden. 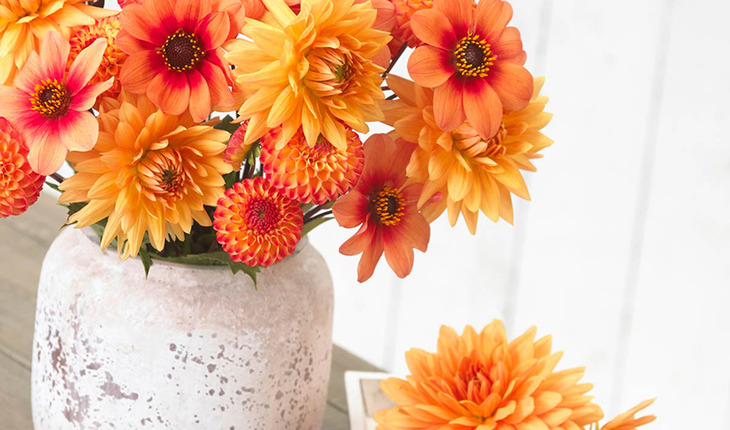 Dahlias are spring-planted bulbs with big, colorful flowers that bloom continuously from midsummer to the first fall frost. Dahlias dazzle with their many unique flower shapes and sizes. The brilliant color and rolled petals of the cactus dahlia Karma Red Corona are sure to make you stop and take a second look. Or consider the powder puff blooms of Myrtles Folly, with petals that capture the colors of a sunrise. Dinnerplate dahlias, like deep purple Thomas Edison, grow 4 feet tall and have enormous, 8” flowers. Suppliers like Longfield Gardens offer dozens of dahlia varieties as well as attractive mixes based on color themes and flower styles. A combination like the Soft Orange mix, works great in the garden and combines nicely in an arrangement. Don’t be afraid to cut your dahlias. Picking encourages more blooms for you to enjoy. With as few as three to six plants you’ll have plenty of flowers to enjoy yourself and share with friends. Since dahlias thrive in the same great soil as vegetables, consider adding a few plants to your food garden as well. You’ll be able to cut fresh flowers for the dinner table when harvesting the vegetables for your next meal. In northern areas where dahlias are not winter hardy, the tubers can be dug and stored indoors for the winter. Or make it easy and just treat your dahlias like other annuals. With so many wonderful varieties to choose from, it’s fun to try different ones each year.